What will the coppers here do?? Eventually I knew this day would have to come, and now that it has I have no idea how to feel. I was tipped off, so to speak, a few weeks ago about my father and his ailing health, how the cancer that he boasted he’d beaten to me last year had returned with a vengeance and was now beyond treatment. How he’d been sent home as there was nothing left that could be done for him and how he’d made his own peace with the world that he existed in, and how he was content because his family were going to be by his side. Interesting stuff this. 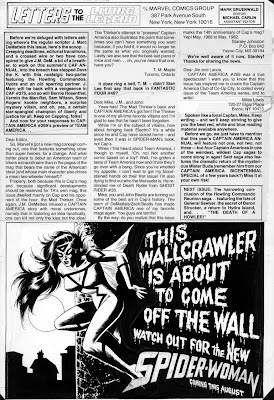 Currently on eBay at the moment are a selection of Captain America letters pages - those pages that a few of us often read but the bulk of people probably ignored totally. What makes these pages interesting is that they all feature a mix of production art in the form of the letters themselves (pasted on) and images - some of which appear to be original art and the rest appear to be mechanical artwork with slight touch ups. Such touch ups doesn't really mean it's original art, but damn, they look kinda cool. My question - has anyone out there actually seen one of these in the flesh, and if so, how many of them actually contain original art in it's purist form? This page is from Captain America #273. The art here isn't original - the Spider-Woman ad, but apparently has been touched up. 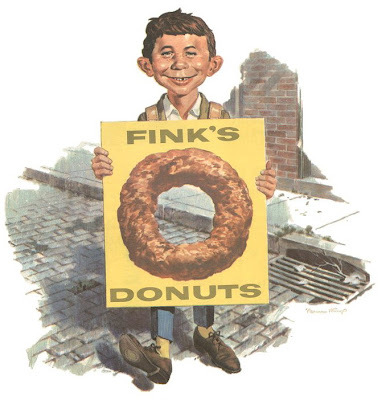 It's clear that this ad isn't the original art as it appeared in several Marvel comics at the same time, having said that, it is a cool little ad indeed. 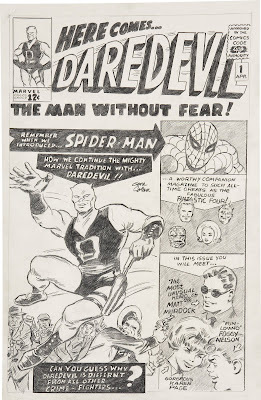 Since I went public with the concerns surrounding the Gene Colan Daredevil #1 piece the consignor has come forward with the following explanation, "Hello everyone, I am the original consignor of this piece. I arranged to have it done directly with Gene and Adrienne many years ago as a gift for my husband. It was to be the first in a series of Daredevil cover recreations and this was before Gene had started doing Daredevil cover recreations. If anyone is interested I do have the original letter that accompanied this piece when Gene sent it to me. "Over the years we have donated a lot of original art to various charities and this was one of those pieces. I hope this helps clear things up." Now, if only Heritage could have done that, instead of being as vague as they are. As it stands, the art is genuine, so bid away!